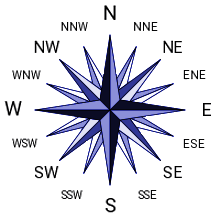 The cardinal directions north, east, south and west describe the four main directions on Earth. Between are the intermediate directions. Those are familiar to most people. To make more exact specifications, degrees are used, with 0 degrees pointing north and then going around clockwise. Here the direction names and angles can be compared to each other. No responsibility is taken for the correctness of the calculations and information.